Priced REDUCED to sell quickly! BRING ALL OFFERS! 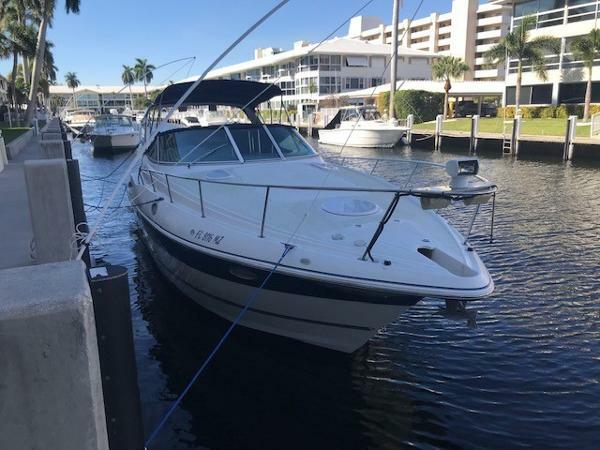 Complete Marine is pleased to offer this very clean 2006 Cruisers Yachts 320 Express equipped with twin MerCruiser 6.2 Horizon Closed-Cooled V-Drive inboard engines. 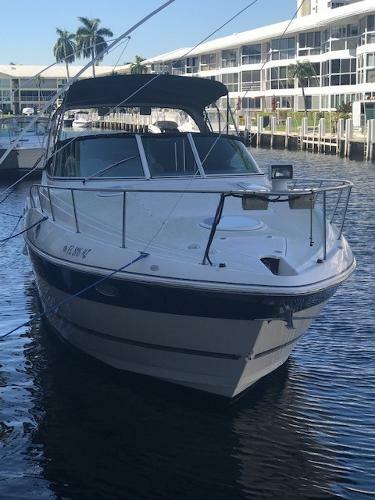 Turn-Key condition, Generator, Air Conditioning, NEW 2017 Raymarine Touch Screen GPS/Fish Finder, NEW 2017 VHF Radio and Antenna, full canvas including eisenglass curtains, cockpit cover, helm cover, and Bimini Top...all in excellent condition. Snap-In carpet for the cockpit area is in excellent condition as well. The cabin features a sofa sleeper in the aft area, a U-Shape Dinette with removable table (converts to sleeper), and the forward berth is large enough for two adults. 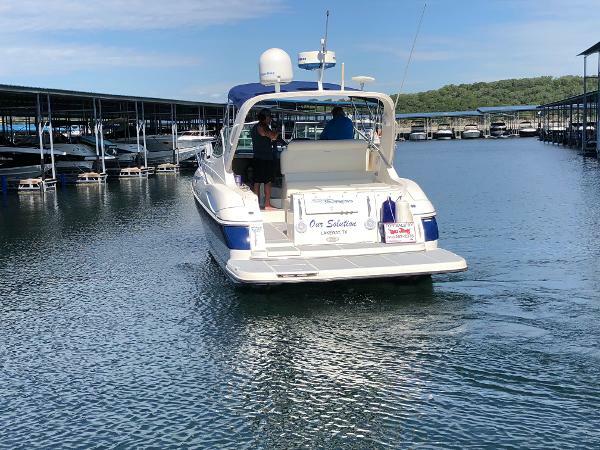 Lockers and storage throughout the boat, a Full Galley with large fridge/freezer, Microwave Oven, Single Burner electric Stove Top, Stainless Sink and Faucet, excellent storage cabinets, and a Coffee Maker. The head compartment is spacious, has a vacu-flush head system with pump-out and macerator. For entertainment the cabin features a flat-screen TV with DVD player and TV Antenna, there is a Clarion AM/FM/CD Stereo system with amplifier and speakers throughout the cabin and cockpit as well as on the bow. 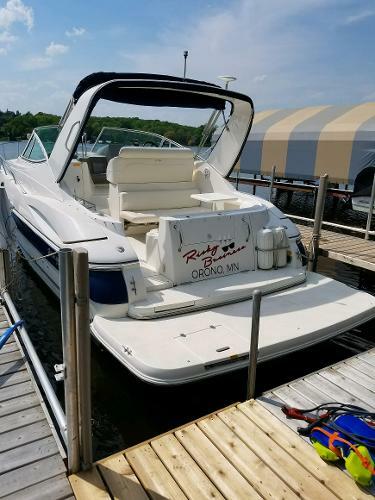 If you are in the market for a well kept mid-size, inboard cruiser with Closed-Cooled engines with low hours...look no further! This vessel is well maintained and ready to go! 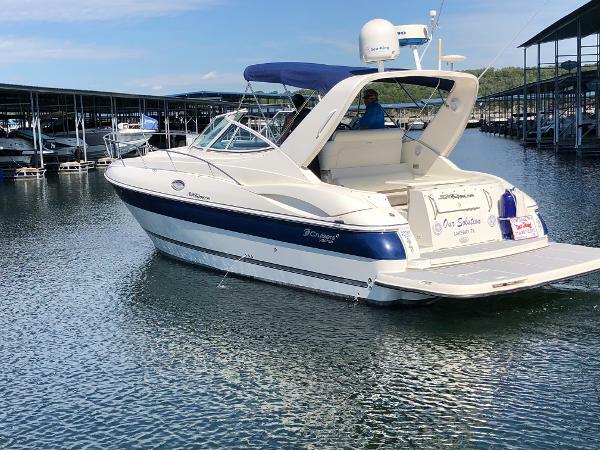 Contact Complete Marine today about this exceptional Cruisers 320 Express! Financing is available and Trade-Ins are accepted. 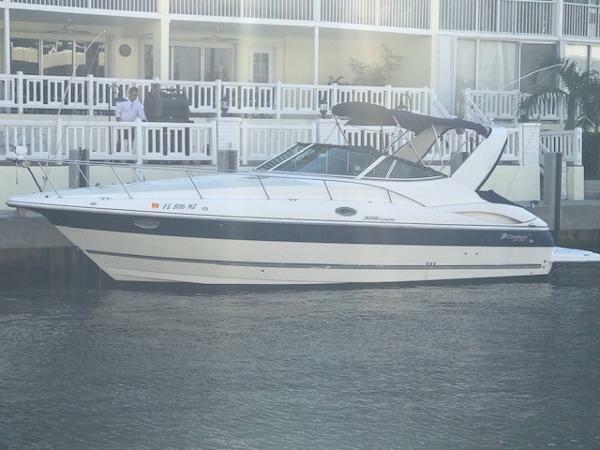 2004 CRUISERS YACHTS 320 EXPRESS w/ Twin 320hp Volvo Penta 5.7 Gxi DP Only 547 hrs. 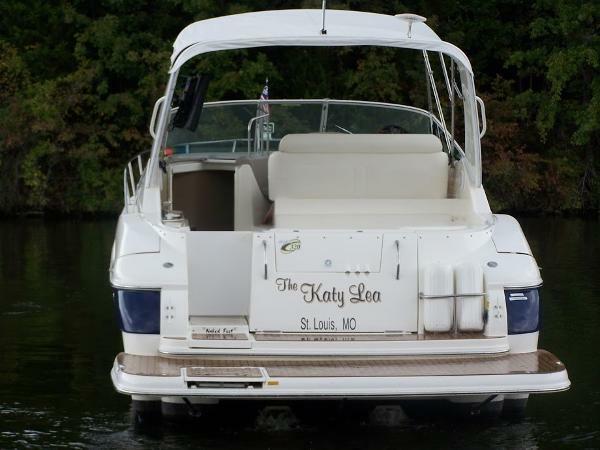 Extremely clean one owner fresh water only boat, one of the cleanest and well kept boats on the market. 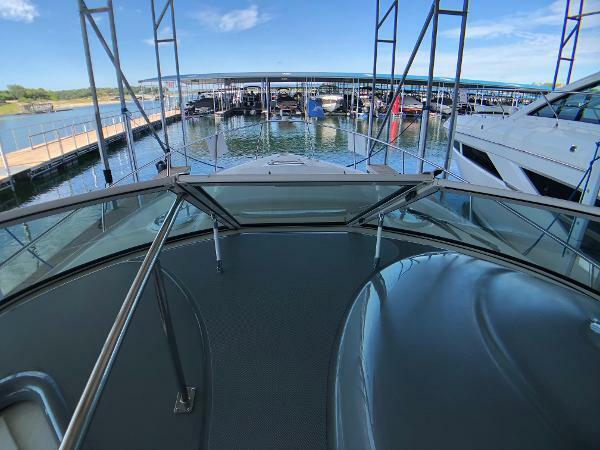 Above deck, the Cruisers 320 Express features a triple-wide helm seat for maximum cruising comfort as well as a walk-through windshield allowing for easy fore deck access. What's more, a fully concealed anchor locker eliminates the toe-stubbing often associated with foredeck chores. Further aft, she offers fore- and aft-facing cockpit seating and a twin convertible cockpit table/sun lounge, perfect for catching afternoon rays. 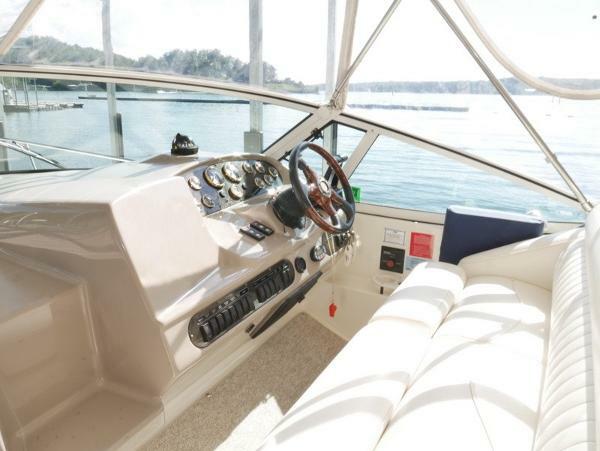 This well-thought-out cockpit arrangement also includes a cockpit shower and an available ice maker, should a delightful summer day call for entertaining on the water. Beneath her sleek express exterior, the 320 achieves an impressive "family room" feel with an airy salon, lovely detailing and elegant appointments. She offers wide-open living space from the forward stateroom to the comfortable aft settee, and she offers more headroom than any boat in her class. Three large ventilating skylights bathe the interior with plenty of natural light. The large forward stateroom includes a generous double berth, ample storage space and a privacy curtain. A fully equipped galley, located to port, offers all the necessary amenities, such as an electric stove, large refrigerator and microwave oven. Across from the galley lies a crescent-shaped dinette, which can be converted into a berth for extra overnight guests. The aft settee also easily converts to a double berth, and a privacy curtain offers an extra measure of convenience. As an additional liveaboard luxury, the 320 features a roomy head, unsurpassed in this size class, with full standing headroom. 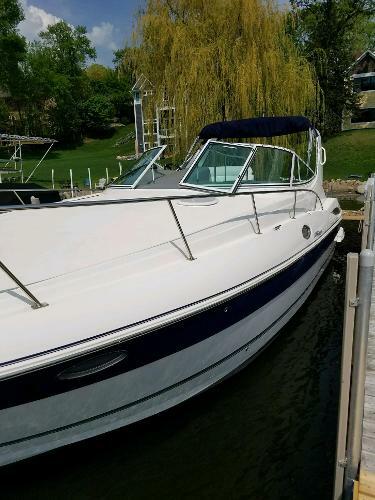 This very nice 2005 Cruisers 320 Express features a triple-wide helm seat for maximum cruising comfort as well as a walk-through windshield allowing for easy fore deck access. What's more, a fully concealed anchor locker eliminates the toe-stubbing often associated with foredeck chores. Further aft, she offers fore- and aft-facing cockpit seating and a twin convertible cockpit table/sun lounge, perfect for catching afternoon rays. 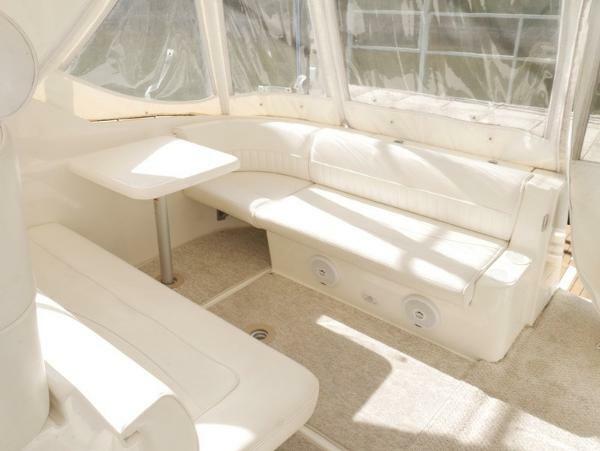 This well-thought-out cockpit arrangement also includes a cockpit shower and an available ice maker, should a delightful summer day call for entertaining on the water. Beneath her sleek express exterior, the 320 achieves an impressive "family room" feel with an airy salon, lovely detailing and elegant appointments. She offers wide-open living space from the forward stateroom to the comfortable aft settee, and she offers more headroom than any boat in her class. Three large ventilating skylights bathe the interior with plenty of natural light. The large forward stateroom includes a generous double berth, ample storage space and a privacy curtain. A fully equipped galley, located to port, offers all the necessary amenities, such as an electric stove, large refrigerator and microwave oven. Across from the galley lies a crescent-shaped dinette, which can be converted into a berth for extra overnight guests. The aft settee also easily converts to a double berth, and a privacy curtain offers an extra measure of convenience. As an additional liveaboard luxury, the 320 features a roomy head, unsurpassed in this size class, with full standing headroom. 422 Engine hours. Impeccably maintained in excellent condition. 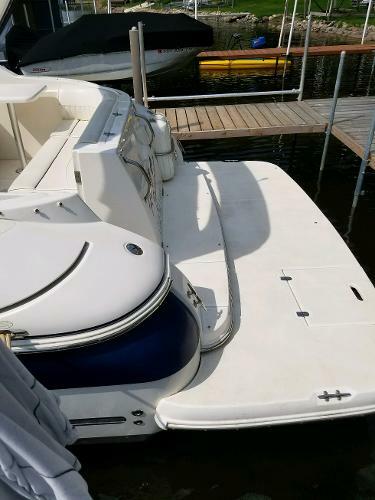 New refrigerato, ice maker, sea-deck cockpit and transom flooring, new bottom job, new impeller, enhanced stereo system, new a/c/heater, new prop, engines recently tuned and has complete service records. Two bimini’s one blue, the other white. 220’ ofchain anchor, full radar and auto pilot. This boat is like new!